If You Own ANY of the Above Crypto-Currencies You Can BUY Physical Gold and Silver RIGHT NOW from Drockton Bullion LLC! 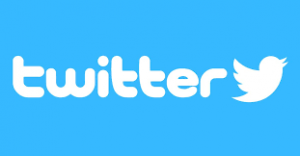 Here is Why You Should! Gold and Silver are at HISTORIC lows right now! The old advice of Buy Low and Sell High is still important today! Gold and Silver are Inflation Hedges. Look at this chart from the last time Interest Rates Went Up and the Stock Market Went Down! Gold would have kept climbing but the banks starting selling naked shorts to drive the price down. Why? Because they have been buying gold! They want it at the lowest possible cost! Don’t believe me? 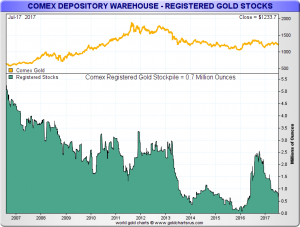 Look at the Comex Gold Inventories! As the Chart shows, Gold Inventories have gone from over 5 million Registered Ounces down to a low of 250,000 ounces a few years ago. Today they are still less than 1 million ounces!. So when supply disappears shouldn’t price go up? Well, it did until the banks started the naked shorts against both gold and silver. 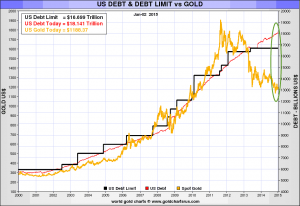 Based on actual inventories gold should be trading at $13,000 per ounce today! Silver is no better off. Same game but a different precious metal! 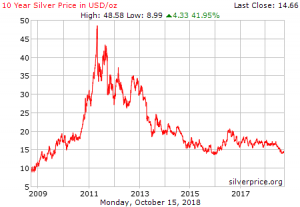 In 2011 one oz of pure .999 silver peaked at almost $50 dollars per ounce! Now it is hovering at about $14. 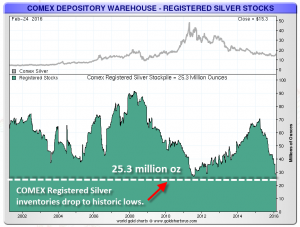 Silver stocks should have quadrupled and the COMEX should be flush with silver bullion! Instead, silver is getting more scarce by the minute! Low supply should mean higher prices right? Banks are driving the prices down because they are buying everything they can get their hands on! 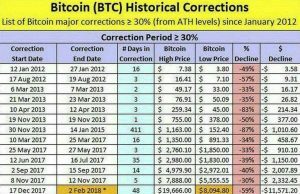 I warned Everyone about the Crypto Crash of 2018! Why? Because I knew the banks could make billions of dollars shorting the crypto markets! I knew that when Bitcoin was added to the COMEX it would be plundered of its value! And it was! After the Banks started shorting it on the COMEX it soon lost more than HALF its value! It will never fully recover! Etherium almost hit $1500. Now its trading at around $200! It Lost 87% of its value! COMEX shorts strike again! Then there is Litecoin. It peaked at almost $350. Now its on the COMEX and the shorts have driven all the way down to $53.00. Ten Reasons Why Cryptos Will Continue to Crash! 1. They are in Competition with the Central Banks! 2. They are hard to Track and Tax! 3. Everybody and Their Brother has one now! 4. Remember the .com Bubble??? 5. They have no Underlying Value! Its all Hype! 6. Banks are doing their own Cryptos! 7. They are nothing but data on a hard-drive! 8, 9 and 10 pretty much sum it up. If the only way price goes up is if someone is willing to take a greater risk than you did…. then its time to dump your cryptos! Let Paul A Drockton M.A. Help You Convert Your Cryptos to Gold and Silver!